← Lambeth 2020 – to Define ‘Anglicanism’ ? It has all the intrigue of an episode of Inspector Morse, but The Mail on Sunday can reveal a real-life drama involving feuding dons and an attempted ‘coup’ at Oxford University. The bitter row centres on The Very Reverend Professor Martyn Percy, who has taken sick leave and is facing financial ruin after a ‘hellish bullying campaign’ to oust him as Dean of Christ Church college. It is claimed the college’s rebellious academics have been ‘combing the statutes’ of Christ Church – founded by Henry VIII in 1546 – to find legal justification to get rid of Prof Percy, who has been tipped as a future Archbishop of Canterbury. One way the plotters believe they can force him out is through a formal complaint about their pay, which is set by the dean. That complaint will now be judged by an internal tribunal. Prof Percy, 56, is also said to have received a stream of legal letters that an insider said risked ‘financially breaking him’ after he was forced to hire his own lawyers. The insider added: ‘So consumed are the dons that the everyday governance of the College has all but ground to a stop. It’s a tragedy, embarrassing and a disgrace. Rebellious academics at Christ Church college are said to be trying to force him out through a formal complaint about their pay, which is set by the dean Prof Percy. 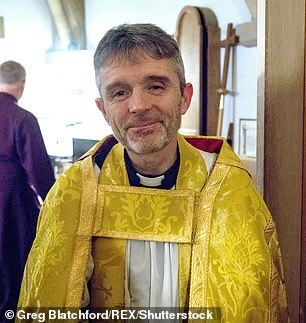 Sources close to the dean, a moderniser who has spoken in support of gay rights and backs women bishops, believe the animosity has been fuelled by an ‘anti-clerical feeling’ among some dons who want to reduce the influence of the Church over the college. It is the only academic institution in the world that has a cathedral. Prof Percy, who was elected in 2014 and whose wife is the chaplain of Trinity College, has been off work for the past fortnight and was last week at a remote farmhouse in Wales. He declined to comment last night. The Bishop of Oxford, the Right Reverend Dr Steven Croft, and Christ Church college expressed concern at the crisis. This episode in the life of a prestigious English University – Christchurch, Oxford – (where my own brother-in-law studied for his ‘Greats’) – is obviously a concern not only for the wider Church of England but also for those who value the integrity of the process of employment of staff at English universities. As Dean of Christchurch, Dr. Martyn Percy has been recognised throughout the Church as a cleric concerned with the reform of the Church of England in matters of social justice for women and the LGBT+ community. Bearing in mind the fact that Christchurch, Oxford, has played a significant part in the academic and cultural formation of many of the clergy of the Church of England, there can be little doubt that – like the Church itself – the College has retained many of the institutional prejudices against any alteration to the status quo that might threaten the tradition and privileges of the College faculty. A corollary of the situation might well be seen in the situation of Pope Francis and his tenure at the Roman Vatican, where the institutional culture of tenure might be in any way threatened by the reforming zeal of a new incumbent. As with the cardinals resident in the Vatican whose lives have been in some way disrupted by the changes in culture that have been brought about by the new arrival; it could well be that some of the academic faculty of Christchurch, Oxford, could find themselves out of kilter with the authority or cultural ethos of the new Dean. As a Church of England ‘Peculiar’ – being the only College at Oxford with its own Dean and Cathedral Chapter – the academic/religious ethos is rather different from that of other colleges at the University; a situation which undoubtedly offers a particular spiritual challenge to the relationship between the Dean and the rest of the Faculty of the University College. As the Dean is also the authority involved in the administration of faculty salaries, this has now become an area of contention in which faculty members can protest against the Dean’s tenure. Thus, any staff members who disagree with the Dean’s reforming activity or, in this case, with his liberal philosophy; have a legitimate (though maybe morally questionable) way in which to challenge his right of tenure. My prayers go up on behalf of Dr Percy (and his wife) as they battle against what seems to be a culture of conservative anti-Church sentiment among a number of the University staff who want to secure his removal from office. The concept of bullying – like that of the U.S. Presidency at this particular time – seems not only unbefitting but also dangerous to the freedom of speech of those who seek justice and basic human rights in their respective communities.